Warren Giles's career started as president of minor league Moline in 1919 and ended 50 years later when he retired as president of the NL. 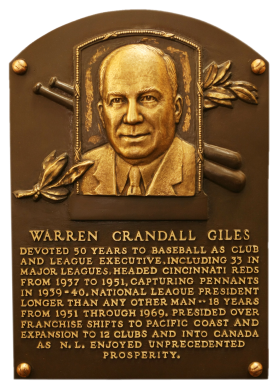 During his tenure, from 1951 to 1969, he oversaw the transfer of the Giants and Dodgers to California, and the addition of franchises in New York (Mets), Houston, San Diego, and Montreal. 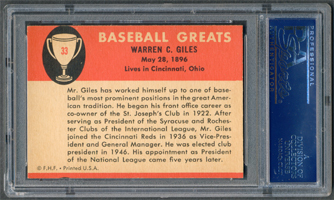 Comments: In August, 2003 I purchased a PSA 6 1956 Topps card of Giles and upgraded to a PSA 7 with an eBay win in December, 2005. 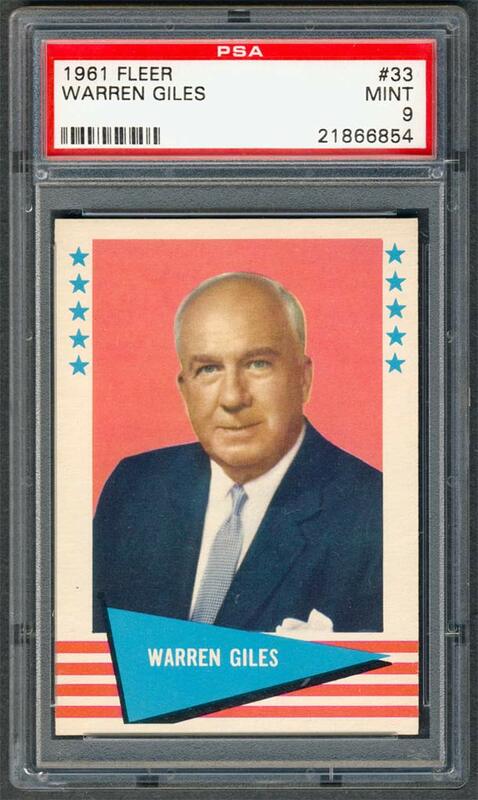 I also owned a William Harridge in the 1956 Topps set so I decided to swap out the Giles for a 1961 Fleer card. I picked up a PSA 8 example in August, 2007 via eBay. In the next six years, I lost out on two separate PSA 9 upgrades - both eBay auctions. Then, in September, 2013 another PSA 9 popped up on eBay with a Buy It Now slightly more than the two previous sales. I made an offer at 80% and the seller countered at 90% - still below the last two sale prices. Sold! 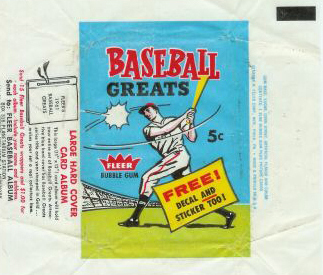 Description: Over a two-year period, Fleer issued another set utiliing the Baseball Greats theme. 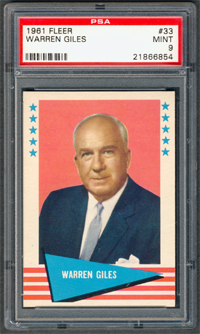 The 154-card set was issued in two series and features a color player portrait against a color background. The player's name is located in a pennant set at the bottom of the card. The card backs feature orange and black on white stock and contain player biographical and statistical information. The cards measure 2-1/2" X 3-1/2" in size. The second series cards (#'s 89-154) were issued in 1962.